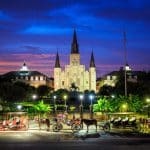 There simply is no other American city with as much heart and soul as New Orleans. In the early afternoon, arrive at the Soniat House, tucked away in a quiet residential corner of the 100-block French Quarter. Balconies, courtyards and fine antiques confer unequivocal Old South ambiance to the three conjoined Creole townhouses that comprise this small, amenity-abounding hotel. Transfer from the airport by taxi, or a Town Car can be scheduled if you wish. After settling in, slip into comfortable walking shoes for a two-hour private tour of the Quarter focused on The History of the Cocktail. 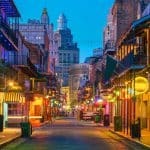 Among its numerous claims to uniqueness, New Orleans happens to be the birthplace of the first American cocktail, served there originally in an egg cup—or, as it’s called in French, a coquetier (possibly the origin of the word cocktail). Your knowledgeable guide will shepherd you to some of New Orleans’ most storied watering holes: the 200-year-old Napoleon House, the Old Absinthe House of 1806, Lafitte’s Blacksmith Shop (dating from 1790), and Arnaud’s French 75 Bar, so named for the cocktail once greatly popular at New York’s departed Stork Club but still going strong in New Orleans. In between entertaining lessons on the lore of New Orleans libations like the Sazerac and Ramos Gin Fizz—and sampling them, temperately of course—your guide will also be pointing out Vieux Carré landmarks like the garret where Tennessee Williams penned A Streetcar Named Desire. Return to the Soniat House to freshen up and relax before dinner. We recommend Antoine’s, which has been in continuous operation since 1840 and is the oldest of the classic New Orleans Creole restaurants. On the menu since 1899 are Oysters Rockefeller, created at Antoine’s and baptized in honor of John D. Rockefeller, the wealthiest American at the time and a nod to the richness of the sauce. Another Antoine’s-originating classic: Pompano en Papillote, a filet baked in a sealed parchment envelope along with shrimp and crabmeat, all swathed in white wine sauce. Don’t omit the chance to pair whatever you order with Antoine’s famous Pommes Soufflées—puffed fried potatoes. The restaurant’s fame rests not only with its recipes but also its astonishing array of dining rooms in which they are served—14 in all, and all with a different theme. Among them: The Rex Room, the Escargot Room, the Japanese Room and the Tabasco Room. Ask one of the long-tenured waiters to squire you around on an expedition to see this vast, historic culinary citadel. Après-Antoine’s, it’s on to nearby favorite venue of ours for an hour or so of genuine New Orleans jazz, performed by a rotating roster of veteran jazz virtuosos, many in their 70s and 80s, who are joined by younger acolytes devoted to carrying on the traditions of the New Orleans sound. This sanctuary to jazz, born in New Orleans in the 1910s through a fusion of African and European intonations, started as a private residence in 1750, and there is no more authentic venue to experience America’s unique sound of music. In your room, or in one of the Soniat House’s several banana-tree-planted courtyards, or on one of its wrought-iron balconies overlooking Chartres Street, enjoy New Orleans-style chicory coffee, orange juice, and homemade biscuits served with local strawberry preserves. Afterward, meander a few short blocks over to the Central Grocery, an old-fashioned Italian-American grocery store redolent both with history and good food. Dating from 1906, the grocery is home to the internationally famous Muffuletta, steadfastly chosen by magazines and travel shows as one of the country’s best sandwiches. Buy one to take away, along with some Zapp’s Cajun Potato Chips and Barq’s Root Beer (both homegrown New Orleans treats) and save it all for an on-the-go picnic during your private tour of the famous Ninth Ward. Transfer to the Lower Ninth Ward by taxi, meeting your guide on arrival. Thrust into the national spotlight following Hurricane Katrina, the Lower Ninth Ward has been completed regenerated as a showcase for innovative residential architecture. It’s largely thanks to actor Brad Pitt, a part-time New Orleans resident since 2002. His Make It Right Foundation has realized the construction of nearly 100 safe, energy-efficient and affordable houses, most of them on stilts, and all displaying striking, leading-edge designs by a team of local, national and international architects. A representative from Make It Right will show you around for about an hour. You’ll also visit another reborn section of the Ninth Ward: Musicians’ Village, a collection of new houses that were built specifically for New Orleans musicians who lost their homes to Katrina. These modest dwellings, painted in a rainbow of Caribbean hues, were brought into being largely through the enterprise of New Orleans natives Harry Connick Jr. and Branford Marsalis, who spurred this inspiring redevelopment by winning an ongoing commitment from Habitat for Humanity. You’ll finish the tour of the Ninth Ward with a visit to two of New Orleans’ most atypical examples of residential architecture, the so-called “Steamboat Gothic” Doullut Houses of 1905, both of which, thankfully and amazingly, survived the hurricane. Return to your hotel, where you will be collected at 2:00 pm, setting out for your exploration of the bayou. Board a boat for four-hour afternoon swamp tour. Amid towering cypress festooned with Spanish moss (just 20 miles south of the city), your captain, a native of the Barataria Swamps, will share his deep acquaintance of this extraordinary eco-system, pointing out alligators and turtles (both being devoted sun-worshippers and thus probably perched on logs), exotic birds and healing plants. 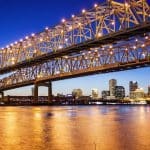 You’ll also see a 2,000-year-old Indian burial mound, a Cajun cemetery and a fishing village, where you’ll learn all about how Cajuns go about hauling in the shrimp and other seafood that are at the foundation of Cajun and Creole cuisine like Shrimp Étouffée, Shrimp Rémoulade and Shrimp Gumbo. Return to the Soniat House—with an appetite probably whetted for seafood. For dinner we recommend a restaurant famous for its traditional fare: Blackened redfish with a Creole crawfish sauce, bacon-wrapped Gulf shrimp served with macque-choux (an indigenous corn-based side dish), New Orleans-style barbecue shrimp and cheese grits, and the house po-boy (a version of the local French bread sandwich made with fried green tomatoes, Gulf shrimp and a house-made remoulade sauce). Wander up Frenchman Street, which is lined with single-story Creole-style cottages dating from 1790 to1850, as well as numerous funky bars—both old and new—that now serve as the city’s most popular live-music venues. The offerings range from bluegrass banjo-picking to swing to jazz and everything in between, and the best way to experience this motley scene is to wander from place to place and sample what’s playing. After chicory coffee, prepare for departure from the Soniat House by leaving packed luggage with the concierge. Sunday brunch in the Big Easy is a time-honored custom for locals and visitors alike, and it’s a tradition we encourage you to observe. Stroll west through the Quarter—Sunday morning is when it’s at its most tranquil—past Jackson Square and over to Canal Street to catch the uptown street car. The venerable New Orleans streetcars date from the first half of the 19th century, and the line you’re taking—along St. Charles Avenue to the Garden District—is the oldest continuously operating street railway in the world. Alight at Washington Street, right in the heart of the Garden District, home to a collection of exquisitely maintained Southern mansions, and walk two blocks another of our favorite restaurants. Its kitchen alumni include chefs Paul Prudhomme and Emeril Lagasse, and it hosts one of the city’s liveliest and tastiest jazz brunches: Bloody Marys made with local yellow heirloom tomatoes, turtle soup (finished tableside with a splash of sherry), eggs cochon de lait, featuring a spicy Tasso Hollandaise (tasso is a sort of Cajun ham) and, for dessert, Creole bread pudding soufflé served with a whisky cream sauce. Walk off some of those calories with a stroll around one of New Orleans’ oldest cemeteries nearby. Because New Orleans is at sea level (and some parts are even below it), above-ground tombs are the norm. Established in 1833 and lined with row after row of these timeworn burial chambers, this cemetary provides a first-rate example of these picturesque resting places. It is also famous for serving as a memorable location in the film Easy Rider and it is frequently featured in the fiction of Anne Rice, first appearing in Interview with a Vampire. Take a taxi for a ride back to the Soniat House, and from there to the airport for a late-afternoon departure.